A dozen UC Berkeley graduate students eager to learn about different campus initiatives on international development participated in the second “Innovation Crawl” Nov. 20, hosted by the Development Impact Lab (DIL). With the support from the U.S Agency for International Development, DIL hosts events such as the Innovation Crawl and funds projects that are at the intersection of technology and international development. The Innovation Crawl was organized by DIL’s Idea Team—a group of interdisciplinary graduate students dedicated to bringing together students, researchers, and faculty working on international development and promoting cross-campus exchange. Participants at the Innovation Crawl come from diverse interests, countries, and disciplines. They included Master’s and PhD students in Public Health, Business Administration, the School of Technology, Development Practice, and Public Policy. “The university, like much of the world, operates in silos. For someone like myself who is on the policy side of social issues, I see the importance of understanding what everyone is doing in different departments,” said Sasha Feldstein, a first year Masters of Public Policy student at the Goldman School of Public Policy. 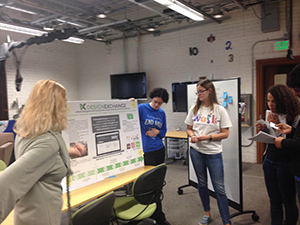 Inspired by the spirit of “bar crawls,” the Innovation Crawl included a tour of four labs and centers on campus. The first stop was the Center for Information Technology Research in the Interest of Society (CITRIS), which focuses on four core initiatives—Energy, Health Care, Intelligence Infrastructure, and Data and Democracy—to address pressing social and environmental issues facing California. Brandie Nonnecke, a research and development manager of the Data and Democracy core, presented the California Report Card, an online platform that allows visitors to grade the state’s performance on policy issues such as immigration and higher education. The report card was developed by CITRIS in collaboration with the office of Lt. Governor Gavin Newson to harness technology for increased democratic participation. The group crawled onward to the Berkeley Institute of Design, where Mechanical Engineering Professor Alice M. Agonino showed different human-centered, interdisciplinary design projects, ranging from data collection on Massive Open Online Courses to sustainable design projects in Native American communities. The final stop was at the Visualization and Control of Biological Assembly Lab, also known as the Fletcher Lab, where students got a first-hand look at tools being engineered to improve the landscape of disease diagnosis around the world. Frankie Myers, a research scientist at the Fletcher Lab, presented CellScope, a technology that turns the camera of a mobile phone into a high-quality light microscope to image patient samples and diagnose diseases such as tuberculosis. Ali Mohammed, a Somali healthcare practitioner who attended the Innovation Crawl, said that in his home country devices such as CellScope could be crucial, as many deaths occur from curable diseases that are not diagnosed due to lack of equipment, energy, or trained medical professionals. The DIL Idea Team plans to have more Innovation Crawls that are tailored to themes such as sustainability and health and that address the changing field of international development.